Sehen Sie Pompeji mit einem privaten Führer und erkunden Sie die archäologische Stätte in Ihrer Freizeit. Nach der Abholung vom Kreuzfahrtort, fahren Sie nach Pompeji für eine geführte Tour der Ruinen. Halt zum Mittagessen in einem Weingut an den Hängen des Berges. Vesuv (oder Restaurant Ihrer Wahl), bevor Sie entlang des Berges Krater wandern. Bewundern Sie die Aussicht auf die Bucht von Neapel, Capri, Ischia und die Küste von Sorrent, bevor Sie zurück zum Hafen fahren. We had a separate guide for Mt. 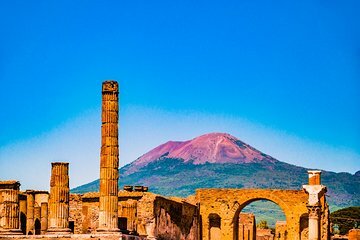 Vesuvius and Pompeii. Both were very knowledgeable. The guide for Mt. Vesuvius shared several facts with us as we drove to the mountain. This was good, as once we started climbing it would have been difficult to talk. It is a steep hike with loose gravel so have good shoes and water. There are two stops that have snacks and drinks also. We celebrated the climb with lemonciello at the top! Pompeii was very interesting and can't imagine not having a guide to make sense of it all. She was extremely knowledgable and passionate about Pompeii. Both tours included just our family, so very personal.